December 1957 cover. 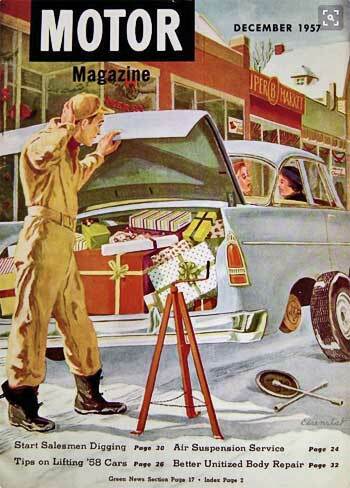 Two women chat in the front seat as a mechanic tries to fix a flat — but he opens the trunk to find it full of wrapped Christmas presents. Benjamin Eisenstat (June 4, 1915 — August 15, 2001) was a well-known Philadelphia painter, illustrator, muralist, cartoonist, and teacher. While he preferred watercolors and acrylics, he used a variety of mediums throughout his career. He studied at the Graphic Sketch Club, the Barnes Foundation, and the Pennsylvania Academy of the Fine Arts. He married fellow artist Jane Sperry in 1940 but left home to serve in the military during World War II. He did drawings of the war in Europe and exhibited some of those in Heerlen, Holland in 1940 and at the Albany Institute for History and Art in 1945. Upon returning home, he thought he'd get into the advertising field to earn some money while he went back to school to start his career as an artist. To that end, he took his portfolio to Philadelphia advertising agency N.W. Ayer and Son. The advice he got there was to take an advertising class at the Philadelphia Museum School of Industrial Art to help him transition from fine art to commercial art work. When he submitted an application at the Philadelphia College of Art, though, he got a job offer instead. From 1946 to 1969, he served as associate professor of painting and drawing and in 1969, was promoted to full professor as well as chair of the illustration department. He retired as professor emeritus. From 1962 to 1966, he was also watercolor instructor at the Philadelphia Museum of Art, and he gave classes at the Fleisher Art Memorial and the Barn Art Center in Moorestown, Pennsylvania. Eisenstat wrote and illustrated in Coming Events in Britain, Ford Times, the New York Sun Times travel section, the New York Times, Philadelphia Inquirer, Graphis magazine, Today magazine, Saturday Review of Literature, Christian Herald, and the Christian Science Monitor. His articles about the history of illustrating appeared in Southwest Art and Step-by-Step Graphics. Additionally, he had commissions from Ford Motor Company, Burlington County Trust Company, N.W. Ayer (no further classes required), the Provident Mutual Life Insurance Company, First Bank of New Jersey, Squibb Inc., and others. He exhibited at more than thirty solo shows and numerous group shows, as well. His exhibition venues included the Metropolitan Museum, American Watercolor Society, National Academy of Design, Chicago Art Institute, Cleveland Museum, Detroit Institute of Art, Pennsylvania Academy Of the Fine Arts, Philadelphia Museum of Art, Norfolk Museum of Arts, Museum of Modern Art, and the Springfield Museum. Popular as a patient and caring teacher with a great sense of humor, he and his wife amassed a world-class collection of nineteenth and twentieth century illustrations — largely to show their students examples of America's rich history of illustrations. The artist received numerous awards from the Pennsylvania Academy of Fine Arts and the Philadelphia Watercolor Club (where he held membership for 51 years). The Society of Illustrators selected him as their 2003 honoree. Eisenstat was a member of Artists Equity, Philadelphia Watercolor Club, American Watercolor Society, Fellowship of the Pennsylvania Academy of the Fine Arts, and the Philadelphia Art Alliance. In the mid-eighties, he retired from teaching and moved to Palo Alto, California where he continued to lecture and keep track of the artistic development of former students. He died there at a Veterans Affairs Hospital, of congestive heart failure.